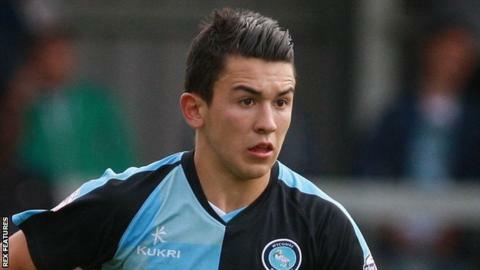 Midfielder Luke O'Nien's header gave Wycombe Wanderers victory over Bristol Rovers to lift them into the League Two play-off places. Rovers keeper Steve Mildenhall kept it goalless on the half-hour mark when he pushed Joe Jacobson's free kick wide. The visitors had their own chances and needed Ryan Allsop to stop Lee Mansell and Ollie Clarke finding the net. But O'Nien gave Wycombe a valuable win when he latched on to Jacobson's free-kick to head past Mildenhall. The result means the Chairboys leapfrogged Bristol Rovers and move up to sixth in League Two, whilst Rovers slip to 10th. "It's a huge three points. The best team won as well. I really do believe that today. I think we reduced Bristol into a long-ball team. They play some good stuff, they do knock it about well. We restricted that today. "It was ironic that a set play determined this game, because there was plenty of good football out there. We worked really hard this week on what we were going to do. "I have to give major to credit to Richard Dobson and Barry Richardson, and my staff and my two coaches. Without them I'd be nothing and they've been fantastic this week." Match ends, Wycombe Wanderers 1, Bristol Rovers 0. Second Half ends, Wycombe Wanderers 1, Bristol Rovers 0. Attempt missed. Sam Wood (Wycombe Wanderers) left footed shot from outside the box is too high. Attempt missed. Lee Brown (Bristol Rovers) right footed shot from the left side of the box is close, but misses to the right. Joe Jacobson (Wycombe Wanderers) wins a free kick in the attacking half. Foul by Tom Lockyer (Bristol Rovers). Corner, Bristol Rovers. Conceded by Anthony Stewart. Attempt blocked. Rory Gaffney (Bristol Rovers) left footed shot from the left side of the box is blocked. Corner, Bristol Rovers. Conceded by Ryan Allsop. Attempt saved. Matty Taylor (Bristol Rovers) left footed shot from outside the box is saved in the bottom left corner. Substitution, Bristol Rovers. Rory Fallon replaces Liam Lawrence. Goal! Wycombe Wanderers 1, Bristol Rovers 0. Luke O'Nien (Wycombe Wanderers) header from the centre of the box to the bottom left corner. Assisted by Joe Jacobson. James Clarke (Bristol Rovers) is shown the yellow card for a bad foul. Stephen McGinn (Wycombe Wanderers) wins a free kick in the attacking half. Foul by James Clarke (Bristol Rovers). Foul by Paul Hayes (Wycombe Wanderers). Liam Lawrence (Bristol Rovers) wins a free kick in the defensive half. Substitution, Wycombe Wanderers. Gozie Ugwu replaces Max Kretzschmar. Attempt saved. Lee Mansell (Bristol Rovers) right footed shot from the left side of the box is saved in the centre of the goal. Attempt blocked. Ollie Clarke (Bristol Rovers) right footed shot from outside the box is blocked. Billy Bodin (Bristol Rovers) has gone down, but that's a dive. Paul Hayes (Wycombe Wanderers) wins a free kick on the left wing. Foul by Mark McChrystal (Bristol Rovers). Attempt saved. Jason McCarthy (Wycombe Wanderers) header from the centre of the box is saved in the bottom left corner. Rory Gaffney (Bristol Rovers) is shown the yellow card for a bad foul. Sam Wood (Wycombe Wanderers) wins a free kick on the right wing. Foul by Rory Gaffney (Bristol Rovers). (Wycombe Wanderers) wins a free kick in the attacking half. Attempt saved. Ollie Clarke (Bristol Rovers) right footed shot from outside the box is saved in the top centre of the goal. Substitution, Bristol Rovers. Matty Taylor replaces Jermaine Easter. Attempt saved. Lee Mansell (Bristol Rovers) right footed shot from the centre of the box is saved in the centre of the goal. Corner, Bristol Rovers. Conceded by Stephen McGinn. Corner, Bristol Rovers. Conceded by Michael Harriman. Attempt saved. Paul Hayes (Wycombe Wanderers) right footed shot from the centre of the box is saved in the centre of the goal. Stephen McGinn (Wycombe Wanderers) wins a free kick on the right wing. Foul by Liam Lawrence (Bristol Rovers). Attempt blocked. Liam Lawrence (Bristol Rovers) right footed shot from outside the box is blocked.